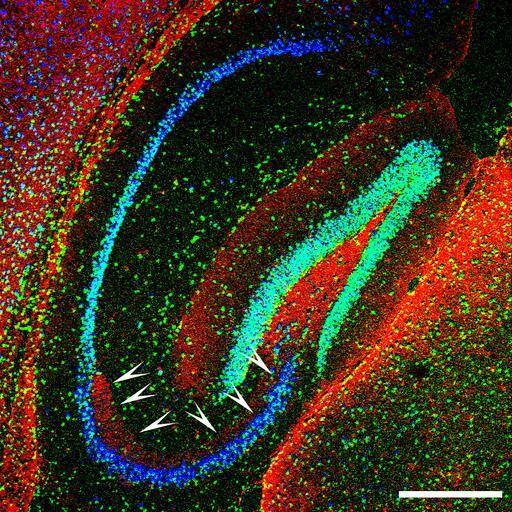 Toll-like receptor 9 (TLR9, red) expression in the hippocampus of the adult mouse brain. Notably, TLR9 stains selectively the mossy fibers (indicated by arrowheads) but not other axonal pathways in the hippocampus. Neurons were identified with the neuronal marker NeuN (green), and cell nuclei are revealed with DAPI staining (blue). For more information on the function of this receptor in the nervous system, see Ma Y, Li J, Chiu I, Wang Y, Sloane JA, Lu J, Kosaras B, Sidman RL, Volpe JJ, Vartanian T. Toll-like receptor 8 functions as a negative regulator of neurite outgrowth and inducer of neuronal apoptosis. J Cell Biol, 175 (2): 209-1. Scale bar, 500 µm. The adult mouse was perfused transcardially with 4% PFA following anesthetization with avertin. The brain was dissected out and postfixed by immersion in 4% paraformaldehyde (PFA) overnight at 4 °C, embedded in paraffin and cut into 5-µm-thick sagittal sections, which were deparaffinized using a standard histology protocol immediately before immunohistochemical staining. In the staining procedure, tissue sections were permeabilized with 0.5% Triton X-100 (Sigma) for 10 minutes, then blocked with the buffer containing 10% normal goat serum (Sigma), 1% (w/v) bovine serum albumin (BSA) and 0.2% (v/v) Triton X-100 for 2 hours at RT, followed by incubation with primary antibodies of anti-TLR9 polyclonal (Invitrogen) and anti-NeuN monoclonal (Millipore) antibodies at 1:50 dilution in dilution buffer (2% normal goat serum, 1% BSA, 0.1% Triton X-100) overnight at 4 °C. Samples were subsequently incubated with FITC- and/or Cy3-conjugated species-specific secondary antibody/antibodies in the dilution buffer (1:200 dilution) for 1 hour at RT. VECTASHIELD Mounting Medium with DAPI (Vector Laboratories) was used to mount the fluorescently labeled samples and to stain cell nuclei. Images were digitally acquired using a fluorescence microscope (Nikon Eclipse 660) equipped with Spot cooled CCD camera (Diagnostic Instruments).